Recently we started a big project which uses S#arp Architecture and for those who does not know what it is you can go to the site (http://www.sharparchitecture.net/) and have a read, but in a gist it is an open source architectural foundation that uses ASP.NET MVC framework with NHibernate. The following principles of this architecture are Domain Driven Design Focus, Loosely coupled, Preconfigured Infrastructure and Open Ended Presentation that means having those principles in mind the developer can concentrate more on Domain and User Experince part of the application that is being developed. Having said that we used this open-source architecture to leverage on its principles and now we are on the first phase of the project where we are building the Domain layer where we define all the entities needed. If you have a big database this will be a tedious task mapping tables and columns to a classes so I created a TSQL script to generate those entities so that I’ll just copy and paste the output to a cs file and were ready to go. Once we have the data we need, we start to process it and it’s not that straightforward but its easy all you need to do is to gather information whether a column or field is nullable so that we can declare it as nullabe in the codes. 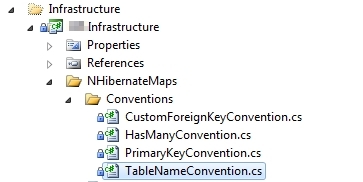 We also need a mapping to SQL DataTypes to .Net Data Types hence the big if conditions. Finally we need to take note of Foreign Keys and what table is it related to as we don’t declare Id’s in the Entities but the class it is related to, hence we have this line. Other than that everything should be straightforward. The above code is made to generate only basic stuff so if you have added validation and other lines in your entities do not use it, otherwise I hope this would make someones life easier.